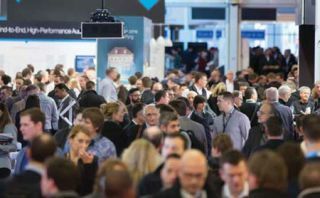 When one considers how crowded some of the aisles and escalators were at the show last year, particularly on the middle day, we can be thankful for the addition of a fourth day at ISE 2016—bearing in mind the fact that attendance increased by just over 10 percent. This year’s total attendance was 65,686, making ISE officially the world’s largest AV and systems integration tradeshow. While the final day—Friday—undoubtedly saw lower visitor levels than the other three days, it was always going to be something of an unknown quantity. The hope is that, as ISE managing director Mike Blackman said previously in an interview with Installation, both exhibitors and attendees become accustomed to treating the final day as a ‘proper’ show day; and initiatives on ISE’s side, such as the Friday Keynote and other events—organized under the FRDY@ISE umbrella—continue to attract visitors to the latter part of the show. Brighter projectors, smaller pixel pitches, higher resolutions, thinner bezels—many of the display trends at ISE 2016 were continuations of well-established themes. Just about every projector manufacturer seemed to be claiming a world first: for instance Barco with the smallest and lightest 4K laser phosphor projector; Christie with the brightest 1-DLP laser phosphor; and Epson with the first 25,000-lumen 3LCD model. SiliconCore was displaying a prototype 0.95mm LED display while Aoto had its 0.75mm M Series on display. Numerous products were unveiled with new capabilities for signal transmission: Wyrestorm’s first HDBaseT 2.0 extender can transmit 4K video a distance of 100 meters (or 1080p 150 meters) along a single Cat-6 cable. While 4K was a common theme across the show, 8K made a few appearances as well. Sharp had the first European showing of an 85-inch display with 8K resolution, and AV Stumpfl launched an 8K version of its Wings Engine Raw media server. While Hall 7 has unofficially been ‘the audio hall’ at ISE for a few years now, 2016 saw it gain that designation officially, as audio became a dedicated show floor area alongside digital signage, residential solutions, unified communications, and smart building. Audio networking was a key trend this year: the number of Dante-enabled products had risen to 700, although the growth is so rapid that Audinate’s stand graphics and even its pre-show press release contained figures that were out of date by the show. Audinate showcased its Dante Via software, which enables computers and other devices to be connected to a Dante network via USB, Firewire, or Thunderbolt. Genelec, meanwhile, debuted the world’s first audio-over-IP studio monitor. The OCA Alliance demonstrated how open control architecture—now formalized into the AES70 standard—allows different manufacturers’ products, operating with different network transport protocols, to work under a single interoperable control system. We also noticed a continued emphasis on collaboration technology this year. While Microsoft was not exhibiting in its own right, a number of its partners, including TDMaverick and AVI-SPL, were demonstrating Surface Hub. Other notable products in this area include DisplayNote Montage, which connects up to 12 devices from anywhere in the world to a meeting room display; and SMART Technologies’ SMART kapp family, which can handle up to 35 remote participants. Barco launched two new members of the ClickShare family: the CSE-200 for enterprise rollouts requiring enhanced security features or central management; and the more basic CS-100 huddle room solution, which displays one user’s screen at a time. Polycom showcased the eye-catching RealPresence Centro. Featuring 360-degree voice and video technology that automatically tracks the speaker, while also showing the entire meeting space on the same screen, Centro is purpose-built to put people at the center of collaboration. There was also an emphasis on audio quality in meeting and huddle rooms with the launch of products such as Sennheiser’s TeamComnnect Ceiling, Shure’s Microflex Advance, and Biamp’s Devio. Paddy Baker is editor of Installation magazine, SCN’s sister publication in the UK.